It appears this year’s hurricane season is lasting longer than usual (it feels as though we’re saying that every year), because Hurricane Michael is terrorizing the Southeastern United States as I type this. As of 5 p.m. ET, Hurricane Michael is 30 miles west of Bainbridge, Ga., and 70 miles southwest of Albany, Ga., with maximum sustained winds of 125 mph, moving north northeast at 16 mph. World News Tonight anchor David Muir will continue to anchor from Panama City, Fla. where he has been covering the storm since Tuesday evening. He will anchor World News Tonight from Panama City Beach on Wednesday. Chief meteorologist Ginger Zee is in Mexico Beach, Fla.
Meteorologist Rob Marciano is in Panama City Beach, Fla.
Newsone Correspondent Maggi Rulli reports from Panama City Beach. CBS Evening News will be live across all time zones tonight with CBS Evening News anchor Jeff Glor anchoring from Panama City Beach. CBS News will do a special report this afternoon ahead of Evening News when Michael makes landfall. A team of CBS News correspondents will contribute from across the region for tonight’s Evening News and CBS News’ division-wide coverage, including Manuel Bojorquez, Nikki Battiste, Jericka Duncan, Mark Strassmann and Omar Villafranca. For CBS This Morning, Jeff Glor is anchoring the coverage from Florida with Gayle King, Norah O’Donnell, John Dickerson and Bianna Golodryga anchoring from the CBS Broadcast Center in New York. The team of CBS News correspondents will report from the field, in addition to WCBS-TV chief weathercaster Lonnie Quinn’s coverage from Studio 57. CBSN will deliver ongoing reporting and live, streaming coverage leading up to and throughout the hurricane, including the public briefings from officials on the ground. 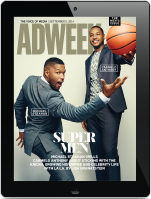 CBSN is available for free across digital platforms. CBS News Radio will provide affiliates with special reports as well as live on- the-scene reporting from Peter King on the Florida panhandle. Jeff Glor will anchor his 5:00, PM, ET, radio newscast CBS News on the Hour from Panama City beginning tonight. 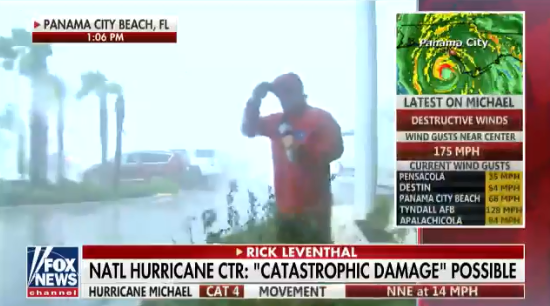 FNC present live coverage of Hurricane Michael throughout daytime and prime time programming as the Category 4 storm travels towards the Florida Panhandle. Beginning at 12 p.m. ET, chief news anchor Shepard Smith will anchor special live coverage from the Fox News Deck, preempting Outnumbered. Jenkins will be reporting live from Alligator Point, Fla.
Tobin will be reporting live from Pensacola, Fla.
Keating will be reporting live from Apalachiola, Fla.
Lester Holt is anchoring tonight’s broadcast of NBC Nightly News from Panama City. Additionally, NBC News and MSNBC correspondents are reporting from various locations across Florida and Georgia as the storm progresses. Gabe Gutierrez in Port St. Joe, Fla.
Mariana Atencio in Port St. Joe, Fla.
Noticias Telemundo has correspondent Rogelio Mora-Tagle on site. MSNBC, Mariana Atencio will provide updates in Spanish for Telemundo as well. NoticiasTelmundo.com has around the clock coverage of the storm. Univision News has been covering Hurricane Michael since it first formed in the Gulf of Mexico. The Univision Network has covered the hurricane on all of its regular daily newscasts. In addition it has covered it through breaking news programming from 2 p.m. to 3 p.m., a west coast update at 3 p.m. ET (12 p.m. PT), at 5 p.m. ET and 8 p.m. ET. Univision has also been providing minute by minute coverage, guides and tips through the Univision News liveblog, on UnivisionNoticias.com and on social media via @UniNoticias and Facebook/UnivisionNoticias.